The lid closes up snug and flush with the base. The interior is very clean. Mirror is in great shape. This one is a really nice example. Enlarge all pics for best details. Starts low with no reserve. Pretty Vintage Round Silver & Gold-Toned COMPACT, "Elgin American"
One I think you call bakelite?. The other says USA on the back top and is a powder compact (also needs cleaned out). Case signed DUNHILL. Pat 4444/28. Reg No 737179. The right side has an eye pencil with two Onyx stone cabochons. The tiny one that lift the pencil is missing but does show black inside. The larger one on top of pencil in intact. Look at photos. Not bad but it's there. Depress Clasp. Dutch HollandMotif. 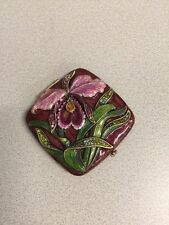 Antique Purse Compact. Silver Tone Engine Turned. Silver Tone Basket Weave Back. Silver Tone Interior. round silver compact #132. Nice Piece. Hinged Makeup Compact By Heinrich Mohr of Pforzheim Germany. Hallmark M with Star: Heinrich Mohr. Gorgeous Antique Victorian Art Nouveau. Marked: 830S (Sterling Silver). Hallmark with national mark: Crescent Moon & Crown. It has a white and blue design and a mirror inside. It closes perfectly but it doesn’t “snick” closed. It stays closed but it has no catch holding it closed. Excellent condition with a tiny bit of wear to the outside bottom. 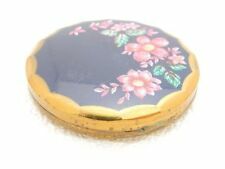 VTG MIRROR POWDER COMPACT~GOLD TONE STRATTON COLORFUL ENAMEL England. Condition is Used. Shipped with USPS First Class Package. 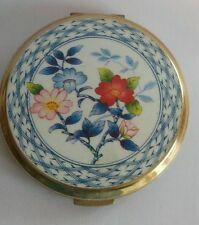 Very lovely Art Deco guilloche enamel compact with chain signed B Co. The compact itself is 3 inches long by 1 7/8 inch wide. The chain is 4 inches. The last photo shows a tiny area of enamel loss on the lower edge. The metal is chrome like, not sterling. It is quite heavy it weighs 3 ounces. The back is marked sterling and the inside is marked nic. Maker Marked "Finberg Mfg Co.". Guilloche compact #868. Antique Compact. Ball Clasp Closure. Bar Chain Handle. Silver Tone Interior. Engine Turned Silver Tone. Very Nice Condition. 1 Beveled Mirror (1 Small Corner Crack). Braided Chain Handle. Ball Latch Clasp. Not Maker Marked "". Silver Tone Floral WreathFront. Silver Tone Interior. Antique Art DecoCompact. silver compact #1952. The hinged lid and sides are decorated with a floral pattern of roses. sanf pnnn A21 1197 1279. .VINTAGE / HEAVY SET GORHAM STERLING SILVER LADIES COMPACT. Opens & closes well, mirror in good condition. Under the hinge to the rear it is stamped GORHAM STERLING 338-0. You should hear a response promptly. 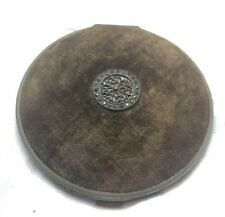 I HAVE TWO MORE VOLUPTE COMPACTS LISTED. MIRROR IS MISSING. NO POWDER OR POWDER PUFF. VINTAGE SPULCIONI FIRENZE LEATH POWDER COMPACT WITH ASTROLOGY ZODIAC THEME. SEE! Marked SPULCIONI FIRENZE with Logo. Unused and in excellent condition a part the square old mirror that has black spots. The front of the case : Blue skies and green trees in the background. OVERALL CONDITION : All original, freash from a dealer. Showing minimal wear and the age of the item. This item is in near mint condition. A terrific art deco Richard Hudnut chatelaine compact case. The case shows signs of wear and surface scratching consistant with age. There is some enamel loss, the middle section of the chain is bent, there is some powder residue. The piece measures approx: 5.5"l x 2.25"w. The inside is stamped Le debut, Richard Hudnut, made in USA. Hallmarked Birmingham with date letter P for 1939. Makers mark is unknown, but resembles a Tree. Opens & closes well. Vintage F.M.CO. Yellow & Green Guilloche Double Enameled Vanity Compact. SEE! Vintage Finberg Mfg. Co.vanity compact with light yellow enamel encased Guilloche, square shape with curved sides and round lid with mint green Guilloche frame. Very elegant colors with four different Guilloche patterns! Unscathed condition and looks much better in person. Heavy small aize and smooth Guilloche. Looks and feels great in person. Interior reveals a rotating powder well, lunette mirror with rouge section. Marked FMCO. Strong hinges and close securely. Measures 2 1/8" square. Please check out my other compacts starting at $0.99 with no reserve. Thank you. Marked HOUBIGANT. Nit really affecting the beauty of this rare Art Deco compact. Compact still full with original puffs and makeup. This item would make a great gift or for personal use. This item's mirror works well and is ready to be used. This item has been previously owned and as is. This item has a very small amount of corrosion around inside lip of compact. CONDITION IS GOOD: THERE IS THE BEVELED CRISTAL MIRROR INSIDE THE CASE. 3 1/8" X2.5". TESTED FOR STERLING SILVER WEIGHT 99.7 GR. Antique Sterling & Jeweled Pill Box Compact Very showy jeweled pill box FEATURES: Ruby Red glass stones Ornate sterling box Stamped 925 on the bottom CONDITION: very good The hinge is good and strong. No wiggle. The compact shuts and stays shut ..makes a Snap noise when it shuts. THINGS TO POINT OUT: very light weight. As with all of my items, this item is FINAL SALE, AS IS, and is NON-RETURNABLE, NON-EXCHANGEABLE, and NON-REFUNDABLE. I have described condition as best I can, but in some rare cases, there may also be other, hidden issues which I have not noticed; if so, they would be very minor and/or likely normal to this type of item, perhaps even from original manufacturing. In that rare instance, my statement of my terms continues to apply. Shipping: I am happy to combine shipping when it is possible and practical. Vintage 1940s Vogue Vanities Enamel Grasshopper Insects Themed Compact. SEE! Beautiful and rare 1940's Vogue Vanities large powder compact with a stunning nature scene. Marked Vogue Vanities. Made in England. Round with flat and hinged cover. On cover two kittens cuddle in beribboned basket. They have pink noses, whiskers, and lots of soft fur. They're real fluff balls. Cover interior has mirror. Unmarked – possibly Austrian. 1930s ~ 1940s ART DECO ELIZABETH ARDEN STERLING SILVER COMPACT W/APPLICATOR NEW YORK MADE IN USA. EA1-EB 001-219. I tried as best as possible to show pictures, both with and without flash. This beautiful compact weighs just over 100 grams. Art Deco "Miss Manhattan by Vanstyle" White Metal Lg Compact Leaping Female Fig. Marked on the interior: "Miss Manhattan by vanstyle Made in USA". 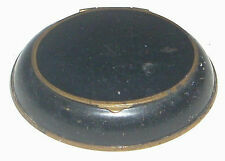 It is marked "E.A.M CO. Sterling"on the rim of the lid inside the compact box. Marked on the box top: “FRENSIE, RED FIRE”, and a code number: “168.015”. Marked on the front of the box: “JOUES CONTRASTE, POWDER BLUSH”, “CHANEL, PARIS, NEW YORK”, “Net Wt. 0.21 OZ., POIDS NET 6 G”. I HAVE TWO MORE VOLUPTE COMPACTS LISTED. VERY GOOD USED. NO DINGS, DENTS OR SCRATCHES. A fantastic quality French sterling silver and gold vanity compact box case with rubies, circa 1940 attributed to Boucheron, Paris. Very good condition. Hallmarked throughout. This is a double sided compact with original powder on one side and original powder applicators for both sides. Each side has a mirror. The closure is strong on both sides, and the hinge is excellent condition.